Meet Mariah, who lives in Florida. You already know Billy. 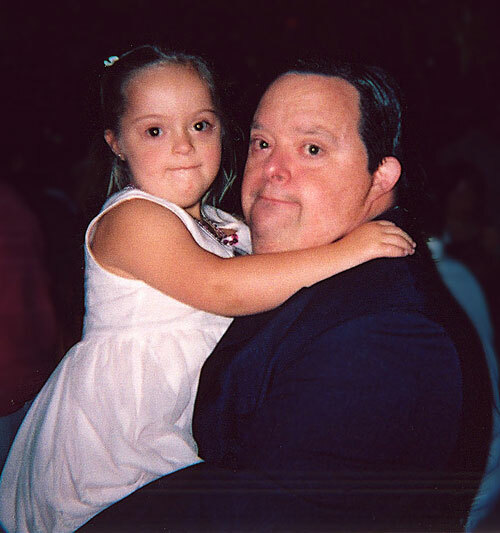 Mariah and Billy met at a Down syndrome conference in Boston, in 2003. Mariah was with her mother Nancy, Billy and I were together, all of us attending a dance following the final dinner of the conference. Nancy and I began talking, Mariah and Billy just looked at each other. Mariah, about three or four, reached up to Billy and he lifted her up in his arms. It was a wonderful, natural moment, one I am delighted to have captured in a photograph. Mariah is now in school in a regular classroom, reading, riding horseback, engaging in many extra-curricular activities. Nancy is a strong advocate for children and adults who have disabilities and has a blog, www.PODS Angels.org, a parent support group for parents of children with Down syndrome in Florida. If you go to a Down syndrome conference, you will be astonished to note that so many children and young adults look as if they belonged to the same family. After a while you begin to feel as if you are in a strange land, looking different from everyone else. You can see that similarity in the faces of Mariah and Billy. You notice the almond-shaped eyes, the smooth countenance, the small nose. And after a while you see the beauty. Looking at this picture, I see innocence, openness, acceptance, wonderment. I see two beautiful people. What do you see?